A wedding can be very costly. The reason why a high percentage choose to just live in or marry via civil is because they want to escape the high cost of the whole ceremony. Each and every detail of the wedding has a corresponding price tag. However, money should never be the reason why a couple can’t have their wedding. The main solution to avoid money matters or issues during a festive and unforgettable moment for couples is a becoming FINANCIALLY PREPARED. A Wedding Fund is essential for every couple on to their engagement period. You set this up as a separate savings account and try as much as possible to save. Leading local banks in the Philippines such as BPI, BDO and Metrobank offers an easy sign up for their savings account. You can as well go to the nearest bank and open one. The Wedding Fund is considered as a short-term fund. You need a bank account that’s easy to open and easy to close with. You don’t want to put your money on a Piggy Bank for your money won’t be protected. Also, a savings account earns some (very few) interest rate that could somehow help too. Those banks that have been in the business for years and those that have zero to none money issues. Read my All About Banking Part 1 and Part 2 for more truths about banking in the Philippines. If you do this you can save as much as 68,000pesos or if you try to double this one you can even earn 130,000pesos in just ONE YEAR!!! 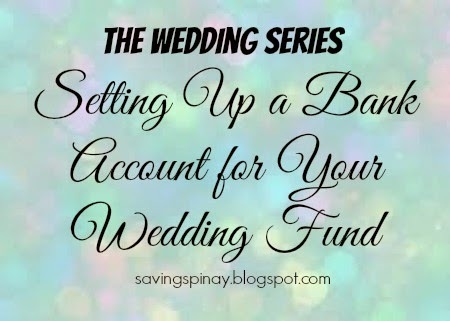 Whenever you have extra money like bonus or 13th Month… automatically deposit them to your Wedding Fund. Every little amount you have is essential. I know it sound embarrassing but if the family is trying to help… don’t decline. They just want your happiness after all. The truth is, people around you will be happy in helping for your wedding whether it may be monetary gift or a service. NEVER EVER be in debt. Don’t let the wedding become the reason for you and your fiance to be in big debt because this debts could haunt your new life as a family in the future. Have additional sources of income. Go for part-time works or sell some stuffs. As early as possible, set up a Wedding Fund for this can eliminate a huge chunk of money discussion during the wedding period. Having a reserved money focused on the wedding can also boost the confidence of the couple. You’ll feel more secure that everything will be in its good shape because you know that you have a dedicated amount to spend. As I always say in every wedding that I host, I believe that there’s no perfect wedding instead there is a “perfect couple.” So don’t feel too pressured with your wedding fund. No More Excuses! 7 Awesome Tips that Will Help You Stop Wasting Your Money – New! Take this Test to Know if You are Financially Fit – New! The Secrets Behind Creating Multiple Sources of Income – New!